Nifty NaNoWriMo progress PSD with instructions. I have a bunch of writer friends. (Duh, right?) We were talking about progress bars, and I said I could make my own progress bar in Photoshop, and they were welcome to it. Click here for the PSD, and keep reading for instructions. So I made it in Photoshop CS6, but I’m pretty sure these instructions will work all the way back to CS5, and what ever the latest creative cloud version is. I’m too lazy to fetch my G5 machine to check it out in CS3, but since changing the hue and doing an anchored transform are all you need to do, it should work in CS3 as well. The default color is pink, since I made it that way for a specific author. (Hi, Akje Majdanek!) I’ll give you the OS X keyboard shortcuts. First thing’s first. Pick a color for your status bar, and the lens flare if you want it. It’s easiest to select the “color copy” layer. 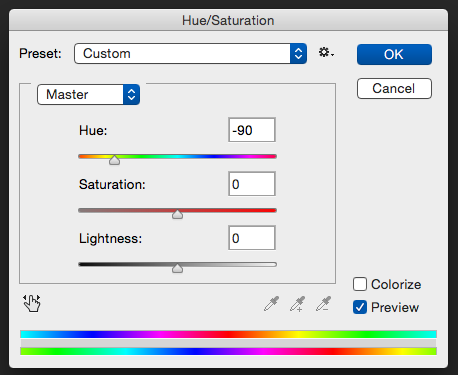 The keyboard shortcut for Hue/Saturation is Command-U. 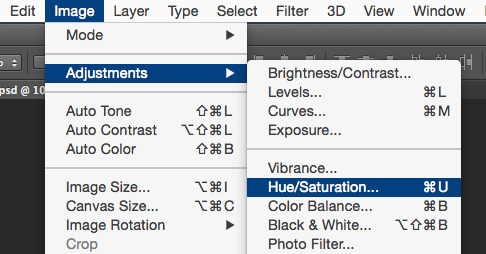 Otherwise, it’s Image -> Adjustments -> Hue/Saturation. 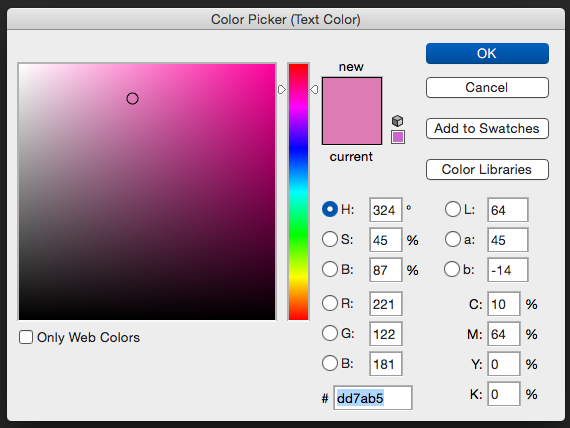 Move the “Hue” slider back and forth until you have the color you want. Once you’ve got it, make note of the value, you’ll need it when you do the same with the lens flare. 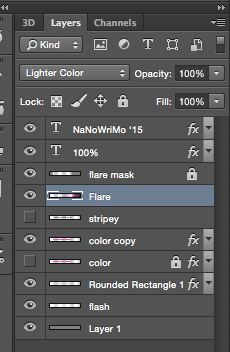 Next, select the “Flare” layer and repeat the process. Instead of using the slider, you can just type the same number into the “Hue” field. Finally, double click on the “T” on the text layer labeled “100%.” This should highlight the “100%,” and enable the text menu. Single click on the pink square in the text menu between the “warp text” tool, and the text alignment icons. When the color selector window pops up, position and click the “eye-dropper” cursor over the status bar you just changed. hit okay, and you’re done with the color. You might want to save the PSD or whatever. Now that that’s done, we can transform the color copy to match your completed percentage. To make this easier, click on the eyeball thing on the “Flare” layer to hide the lens flare. 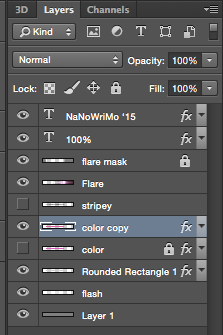 Then click on the “color copy” layer again. To transform, you can do Command-T, or Edit -> Transform -> Scale. You need to set the “Reference Point Location.” Its the icon to the left of the X-axis field. It looks like a 9-key, with the middle key white. Simply click on the square to the left of the current highlighted one. In the width (W) field, replace the 100% with whatever your progress is. After that, click on the eyeball on the “Flare” layer, then make sure the move tool is selected by pressing “V” on your keyboard, or clicking on the top icon that looks like a crosshair and mouse pointer. (if you’re not familiar, it’s the top con in the image for the next step.) You can drag the flare to the left or right, or use the left and right arrows. Line the white center of the flare with the leading edge of the transformed status bar. Finally, click on the “T” on the 100% like you did to change the color, and type in your percentage and the percent (%) symbol. I wouldn’t save anything now. If you save it, you’ll need to reverse the steps to get back to 100%. Since you saved after adjusting the colors, then that can be your baseline. 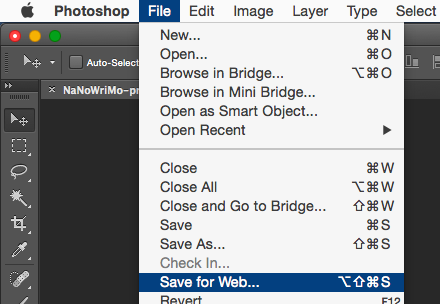 Save your current image with the “Save to Web” feature. The key combination is like four different keys, so I don’t know it, but in the image below you can see it. The sequence is File -> Save for Web. Save it somewhere and name it something you’ll remember. Now you have your current progress. Exit Photoshop, and chose not to save the PSD. The next day, you pick up with transforming the status bar. I’ve left in a locked “color” layer in case everything goes sideways. 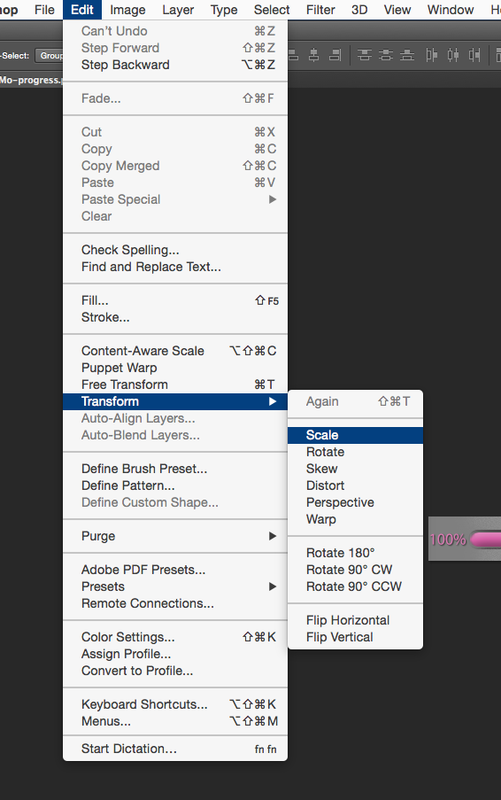 Just duplicate the layer by right clicking on it and choosing “Duplicate Layer.” Make it visible, and unlock it, or just download the PSD again. Have fun, and good luck this NaNoWriMo! This entry was posted on Wednesday, October 28th, 2015 at 05:00	and posted in Uncategorized. You can follow any responses to this entry through the RSS 2.0 feed.